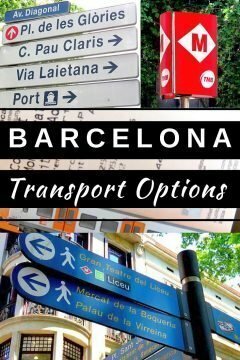 Enjoy this free practical guide for getting around Barcelona including getting to/from the BCN airport. Plus the cheapest ways to get to all the top tourist attractions in the city. Exploring on your own is easy – you just have to decide which of the methods of transportation you wish to use. 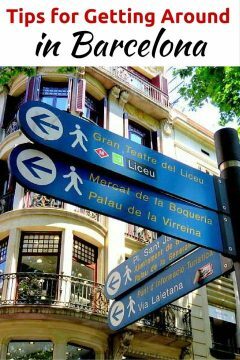 You will find that you have many choices for transport options in Barcelona. My favorite mode of transportation in most cities is walking. Slow, yes – but so enjoyable. I see so much more when I am walking than when I am in a taxi or bus. Just remember to bring comfortable walking shoes and a lightweight backpack for your travels. Break-in those shoes before your arrival so that you can enjoy your visit to the fullest. 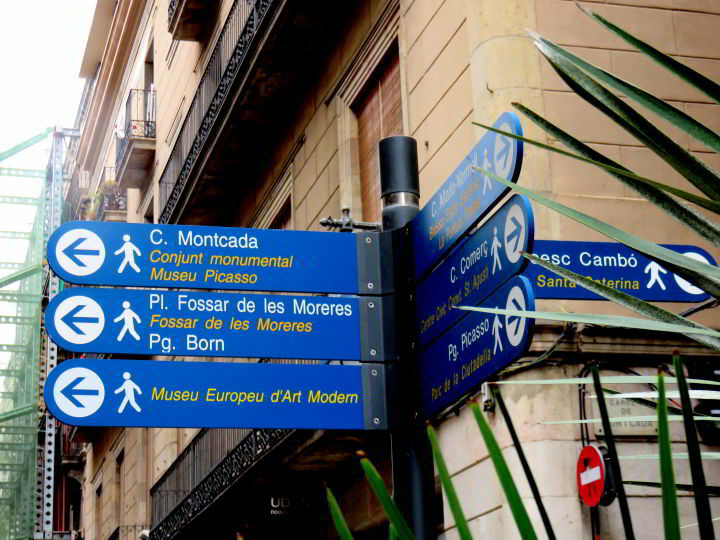 In Barcelona watch for the blue signs pointing the way to tourist sites around the city. You can also buy a handy laminated map of Barcelona to help find your way around on your own. Looking at guide books, I brought both the National Geographic Walking Barcelona guide and the Eyewitness Travel Barcelona and Catalonia guide. A guide book is an easy way to assist in finding your way around Barcelona. Very handy to have when you are exploring on your own on foot. For my first solo trip to Barcelona I took an overnight flight from NYC, landing in Barcelona at 7:15 in the morning. I had researched my options for getting to my Airbnb rental (click here for $40 towards your first rental) in La Ribera neighborhood and AeroBus turned out to be a great option – such a cheap and easy way to get from Barcelona airport to the central historic region. Overall I’ve found shared Airbnb options in Barcelona are a good deal and a great way to meet locals. Just be sure to read a bunch of reviews, look at all the photos, review the cancellation policy, and look at the map before you book your Airbnb. AeroBus is a convenient mode of transportation from BCN El Prat airport to central Barcelona, and back to the airport from the city center. At a cost of 5.90 Euros (single trip is valid for 90 days) or 10.20 (for a return ticket – valid within 15 days of validation) it is also a very affordable option, great for the budget traveler. AeroBus runs every 5 minutes (365 days per year) from airport Terminals 1 and 2. The bus ride takes approximately 35 minutes to Placa Catalunya. Have a look at hotels near BCN El Prat airport – check here for the latest hotel rates – if you have an early morning flight this is a great option to ensure you are at the airport on time – and no traffic worries on your travel day! On my first trip to Barcelona I was through customs and immigration and sitting on the AeroBus within 45 minutes of landing. Another 30 minutes or so and I was getting off the bus at Placa de Catalunya enjoying a sunny morning walk in the historic district. With the AeroBus ticket I was given a coupon book for discounts at local restaurants, art museums, music events, bicycle and scooter rental, etc. Buy your ticket upon arrival at BCN airport or online at the AeroBus website: AeroBus schedule and rates. If you need a ticket to the airport you can also buy tickets at the vending machine at Placa de Catalunya. Barcelona has an extensive public bus system for travel throughout the city. All of the buses have been adapted for people with reduced mobility. On the TMB (Transport Metropolitans de Barcelona) website you can look up information for bus schedules and maps. There is also a new TMB map website where you can enter your beginning and destination addresses for route info. Click here to visit the main TMB website for bus schedules and maps. Metro was my favorite way to get around the city fast and cheap. I bought 10 ride passes (called a T10 card) at the ticket vending machine. 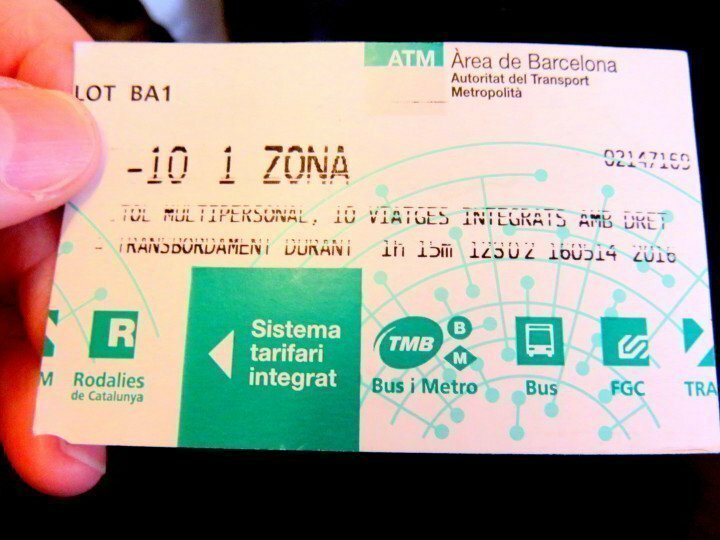 Each time you use the ticket – feeding it into the machine at the entrance to the metro – the date and time of use are printed on the back of the ticket. There are numerous entrances to the underground metro stations so do take note of the street name for the entrance/exit at the metro. Overall I do find metro to be the fastest way to get around Barcelona. If you are directionally challenged like me, you may want to bring a map of Barcelona with you. Metro is air-conditioned – stay cool in summer while exploring the city! The metro lines are identified by number and color. To locate metro stations look for signs bearing a red “M” with white background. 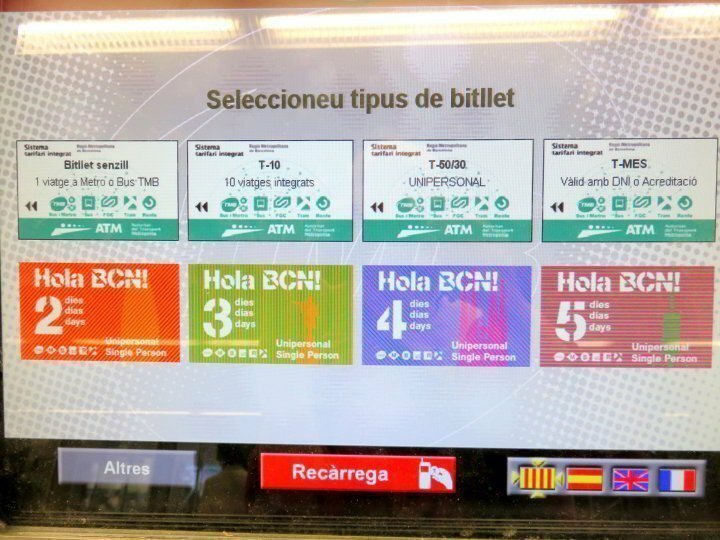 When buying metro tickets from the vending machines at the metro stations you can select language preference on the bottom right-hand part of the display – see the flags in the photo above. Hola BCN! is a special pass that may be purchased for unlimited access to Barcelona public transport. Tickets are available for 2, 3, 4, or 5 days. If you buy Hola BCN! tickets online you can get 10% off. Click here for Hola BCN! tickets. These tourist buses charge a flat rate for the ticket which is good for 24 hours, or you can buy a 2-day option. You can hop-on and hop-off the bus at any of their stops as many times as you like for the duration of your ticket. This is the perfect option for exploring Barcelona by yourself. It’s easy to explore all the top tourist attractions with the Hop-on Hop-off tourist buses. The beauty of the Hop-on Hop-Off Tourist Bus is that you don’t need to figure out how to get to all the best tourist sites – just hop-on and hop-off at the top attractions that you want to see. There are bicycle rental options and there is the Bicing bike-share system in Barcelona. The Bicing website is only available in Spanish or Catalan but here is a link to the Bicing map page. Using Google translate: The map can be display stations in operation and see real-time availability of bicycles at each station. Update: Bicing is set up for locals traveling on short trips around Barcelona – not really for tourists but you can use it for FREE for the first 30 minutes. Bicing bicycle rental service is available year round 24/7 with a few thousand bicycles distributed around the city. If you are living in Barcelona or staying long term you may want to sign up. I am a bit of a chicken when it comes to riding a bike in a city. I think I am too easily distracted and would probably get in an accident due to my lack of attention to traffic. Or I would make such an effort to pay attention that I wouldn’t enjoy the seeing the city as I rode my bicycle. Smaller towns are more my style for bicycle riding but I know plenty of people who would be keen to explore Barcelona by bike. You can zoom around town with a scooter rental. For me, a scooter would offer the opportunity to get lost that much faster and much more often than I do on foot. I did not try out a scooter rental but it looks like a fun way to get around in Barcelona. Taxis are always an option in any major city. I mostly try to avoid using taxis as they are generally more costly than public transportation. I would use a taxi in Barcelona if I were attending an event that was not easily accessible by metro and walking. If you prefer to do the driving yourself then a rental car is a great option. There are plenty of great day trips from Barcelona so a rental comes in handy if you want to get to Sitges or Montserrat on your own. Whatever transportation options you choose for finding your way around I hope you love the city as much as I do. Enjoy your travels! Remember to buy a guide book for Barcelona. Check out my other Barcelona blog posts below. You will find so many attractions in Barcelona you could spend a week and not see everything. I always like to start off with a big bus to get an overview—before walking the streets! I love how you’re sharing all this fabulous information just ahead of our being there! Thanks so very much! 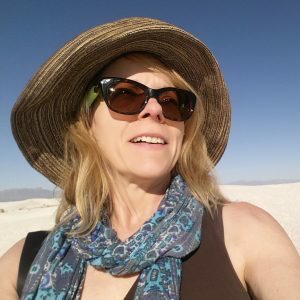 I totally agree with Betsy that this list is timely, given that so many are headed to TBEX in a few days. Barcelona is one of my favorite places in the world and getting around is pleasant and fun — mostly walking for me! Five years ago Conrad and I started out there on the hop-on hop-off bus to get the overview, and we have used the metro extensively as well as regional trains to go beyond the city. But your listing goes way beyond the usual modes and I thank you! I have copied a link to this post on a reference page I have for Barcelona info. Thanks! What handy info! Now I have an extra reason to wish I was going to Barcelona this summer! That AeroBus option sounds like a fantastic service. I have a dear friend there right now! I love Barcelona – I do want to go back. Your post was so fabulous! My favorite way to get around is walking. We also use the metro and hop on and off buses. I think the hop on and off are helpful to take to get your bearings in a new city. My favourite mode of transportation when travelling depends on the location. I was in Barcelona the summer of 2013 and I loved walking in it. I did a lot of walking. We had easy access to both bus and the Metro from where we staying. Although the Metro is a little faster, we preferred the bus because we could look around. I was there in August and there were always line-ups for the tourist hop-on hop-off bus, so we never chose that option. What timely information as so many of us are heading to Barcelona! I’m with you — I absolutely love walking around a city! Thanks for this great compilation, I’ve pinned it to have it handy! Very timely information since we are planning another trip to Barcelona. Thanks! One time we both fell asleep on the bus in Barcelona and woke up at the end of the line. No problem, we got to ride back and see more of the city. I really appreciate blogs like this that give practical advise. Anyone headed to Barcelona will certainty appreciate this detailed information as well! Kay, thank you for sharing! I hope others will benefit from this info while visiting Barcelona. Segway is a good additional mode of transport, thanks for mentioning that. I have never tried a Segway either but I have seen others using them to tour around. Read this eagerly, as we’re returning to Barcelona in a couple of weeks – and we’ll be walking, walking, walking! Thank you the handy and timely Barcelona transport info. Walking and metro for us. We’ll probably get the multi-day passes which are good for all types of transportation. We used them in Singapore. Quick, easy and inexpensive. These also work for regional rail. Three days until I leave for Barcelona, so this is an excellent refresher for me. I prefer walking and will sometimes opt to stay in a more expensive, more central location so I can walk to many of the places on my list of places to see. The last time I was in Barcelona I took the Aerobus, a great option for getting from the airport into town. I’ve been reading scary things about pickpockets on the Metro. Did you feel insecure at all? Thanks for your comment Suzanne. I just used Aerobus again yesterday – bought my return ticket online so I didn’t have to bother getting the ticket upon arrival in Barcelona. I loved using the metro in Barcelona! I think I went through 3 of the 10-trip tickets on my last visit. As for pickpockets, every major city has them. While in any city, when you are among large crowds, I would advise keeping your handbag in front of you at all times. If I were a guy I wouldn’t be keeping a wallet or mobile phone in my back pocket. I felt perfectly safe during all my travels within Barcelona. Enjoy your trip Suzanne!